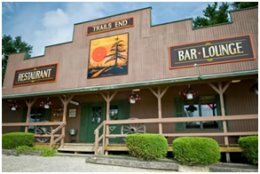 Trails End Restaurant, 2738 Forest Road, Cooksburg, Pennsylvania, offers a fantastic menu featuring everything from wings, salads and other appetizers to full dinner specials. If you prefer a more rustic experience you can sit outdoors and enjoy a BBQ and drink specials. A full range of domestic and imported beers, wines and other legal spirits are available. Want to have a fun night out? Enjoy live music on summer Sunday afternoons. Call us to book a Karaoke or theme party for family, friends or a special occasion.